Bayer Hellas AG was founded in 1977 as a sales organization for agrochemicals. Before that, Bayer businesses had been represented by local companies. 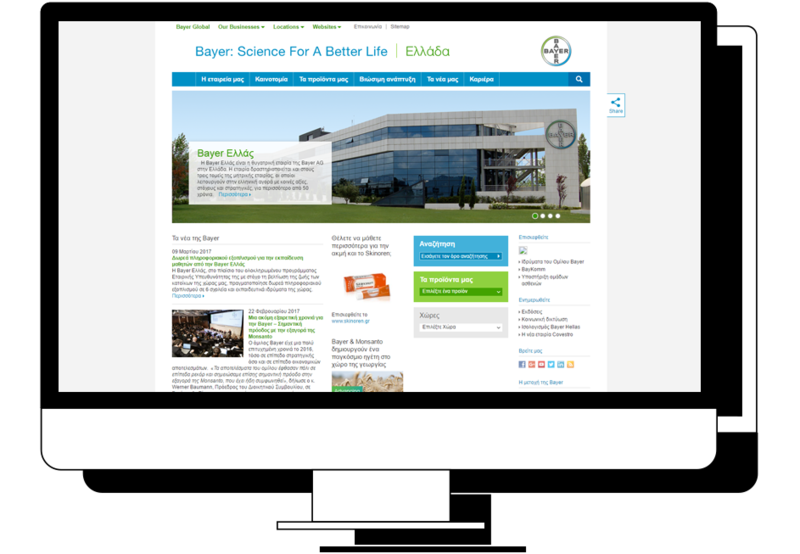 Today the products of Bayer HealthCare, Bayer CropScience and Bayer MaterialScience are marketed by Bayer Hellas. In 2011 Bayer Hellas employed 330 people and the sales reached 188 million euro. Apart from the Athens headquarters there is a sales office in Thessaloniki. Bayer Hellas as a member of a greater corporation needed to follow the international business requirements, which involved the categorization of the extensive volume of information and the renovation of the company’s website to meet the technological advancements of the agrochemicals industry. Bayer was looking for a competent associate that was also a Sitecore certified partner. As a result, Bayer reached Linakis Digital for business collaboration. Linakis Digital realized a user-friendly, entirely manageable website, which follows all international requirements, on the globally top Sitecore, CMS platform. Development team worked on the concept of Information Architecture, in order to categorize the great amount of information and create an uncomplicated user experience. Users may search for the proper chemical solution according to the preferred crop, by simply providing its name on the search drop-down list. The team also realized the Fibermax, a simplified form of social network for professionals, in which certified member, producers are to connect their production and the stakeholders are able to find the desired crop and address to the corresponding representative by completing a form showing his intention to purchase. Linakis Digital has concluded the website’s implementation with the integration of two external services: weather forecast and dress code widget.